Over the course of 12 months, Ireland’s Dealer Group of Australia incurred over $47,000 worth of audit fines. Due to missing documents, and a constant stream of vendors calling their Accounts Payable department for payment of invoices that they couldn’t locate. Sound familiar? It’s a common problem in companies - overflowing cupboards, desk-piled papers and good real-estate taken over with storage. 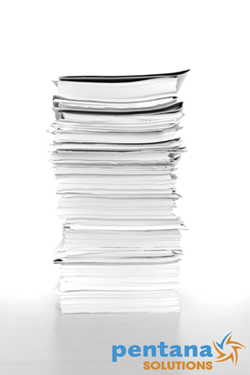 Paper processes can cause serious implications for an entire organisation - misplaced invoices, lost important documents and inevitably audit fines. Pentana Solutions’ DocuSmart suite changes the way account departments are run and luckily Ireland’s Franchise Group took advantage of it. Now that Ireland’s, an award winning multi-franchise group, has implemented Pentana Solutions’ Docusmart Payables and Archive, they have seen a dramatic difference in the way their accounts processes work. IT Manager, Michael Day, tells us that vendors now email their invoices in and straight away they are archived and loaded into Pentana Solutions DocuSmart for review and approval. Assigned approvers receive an email advising that they have invoices to approve with a link to DocuSmart in it. Everything is done electronically - there are no more missing papers. When invoices are received via snail mail they are scanned into Pentana Solutions DocuSmart and then treated as the rest of the electronic invoices. With Pentana Solutions DocuSmart, reporting based on vendor terms and the approver assigned tells Ireland’s when an invoice is overdue, as well as who they are waiting on to approve it. Invoices can be approved at the click of a button or rejected with comments as to why - all without having to bring the invoice to Accounts Payable. Monthly statements can be reconciled against archived invoice lists, and invoices can easily be retrieved at any time from anywhere without searching through shelves and folders. That’s your audit risk right there, before the auditors even arrive.